In a recently published article Beatriz Rodríguez-Labajos and Joan Martínez-Alier review methodologies, typologies, and political implications of water conflicts. Using a political ecology perspective, the authors show how social movements born from such conflicts are creatively generating new modalities of water management and governance. 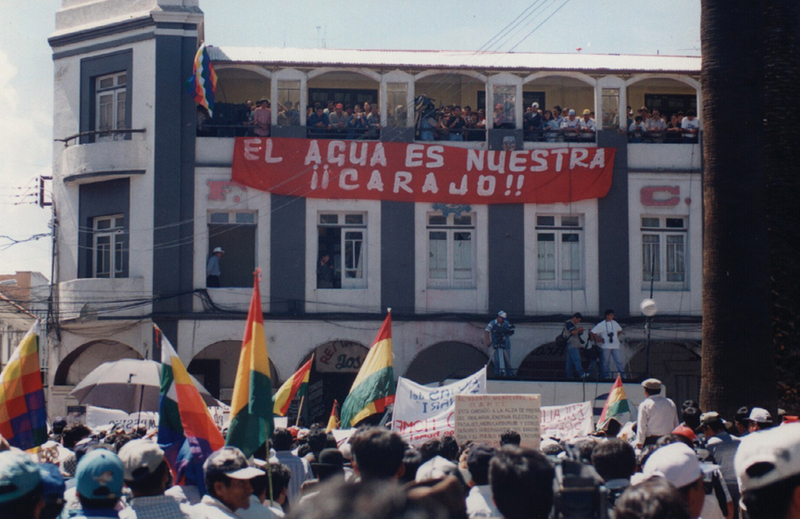 Demonstration during the Water War in Cochabamba, Bolivia in 2000. Source: narconews.com. Historically, water management systems have been designed to influence the hydrosocial cycle, by reshaping river basin waterscapes. The search for adequate quantity and quality of water has motivated the construction of wells and cisterns to collect rainwater for domestic use. It has also motivated inter-basin transfers of water and investments—in money and energy—to obtain fresh water through desalination plants. Through human interference, water accumulates polluting substances and organisms (at times making it unavailable for some human uses) until, on reaching the sea, it obtains its maximum level of entropy—a measure of energy no longer available for useful work. Then, solar radiation returns water to the clouds and the cycle continues sustainably, even though the global entropy production may have grown. This reshaping of the hydrosocial cycle—always embedded in historical and sociocultural contexts—generates both positive and negative effects for different types of actors, thus giving rise to socio-environmental conflicts. From a metabolic point of view, water can be the ‘commodity’ in dispute, as in the case of water privatization conflicts, or it can be the element impacted by a contested project. Commodities move through extraction, transport, consumption and waste. Table 1 catalogues conflicts along the commodity chain through which water is used (e.g. by extracting it through a dam, desalinating it, transporting it through a water supply infrastructure or dumping waste water into a river). Besides such conflicts, there are cases where water is used to enable other commoditization processes (e.g. mineral and fossil fuel extraction and transport, agriculture, aquaculture, agrofuel production, or recreational services). Through all these processes, water quantity and quality are modified to the benefit of some, but become inaccessible for other users. This generates conflict. Many water uses are unjust and ecologically harmful, affecting local communities who depend on the water sources for their livelihoods and survival, and who seldom benefit from the (economic) profits that new water-related commodities yield. Certain water interventions redistribute across social groups water, the costs and benefits of accessing it, and water-derived incomes, at times with detrimental impacts on particular social groups and the environment. The processes described happen at different geographic scales: from the local (e.g. the use of lake water in the proposed Conga gold mine in Peru) to the global (e.g. human-induced global changes in carbon dioxide emissions, which lead to glacier retreat and possibly to ocean acidification). Most water-related conflicts have a geographically restricted reach. For example, the diversion of the São Francisco River is a regional subject, affecting several Brazilian states. Also ‘interlinking-of-rivers’ projects in India, Thailand or Spain generate mostly regional and national debates. 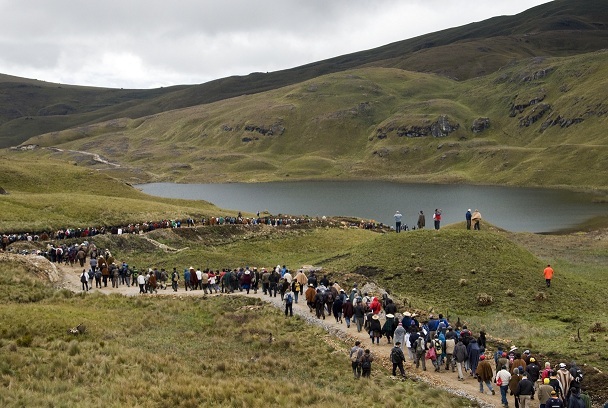 Thousands of residents of Cajamarca, Peru, gather at the Laguna Azul, on the proposed Conga Mine site, in effort to protect their water resources from exploitation and contamination. Source: upsidedownworld.org. However, some water conflicts can ‘jump scales’; they can be simultaneously local and global. A violent mining conflict for example may be local, but it is driven by a globalized commodity and accompanied by exports of virtual water. Similarly, large-scale regional irrigation conflicts may be linked to global agro-industrial processes. Such local, regional or national conflicts thus become glocal when they occur locally in several places, respond to global drivers, or when they acquire global importance. This was the case of the dams on the Narmada River in India that helped constitute the World Commission on Dams. In this vein, some social movements born from water conflicts have proved to be effective providers of alternatives that reshape power configurations. Undeniably, many mobilizations for water justice are merely defensive, facing specific threats of displacement or loss of access to livelihoods. However, the claims go beyond this. Water justice movements and organizations have formed networks and have proposed new principles of water management. They have not only been active in the promotion of the human right to water, but have been the first to endorse the recognition of water, along with other elements of nature, as a subject of rights. 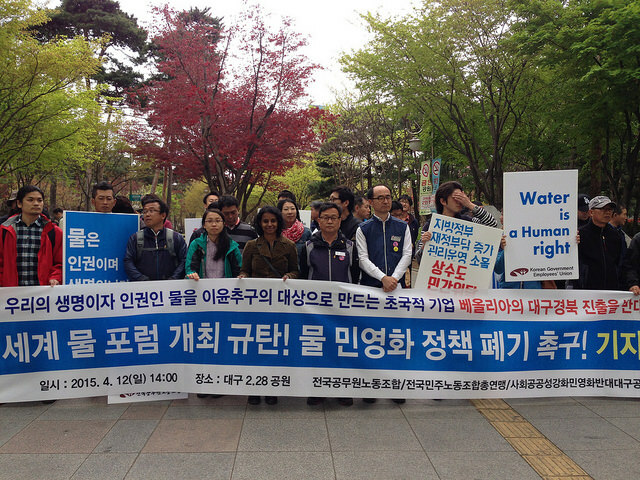 The same claim across the continents: Water is a Human right. Source: The Council of Canadians. Thus water conflicts can boost institutional innovations, at levels of local community management, for public policies and beyond. A well-known example of this was the reaction against the diversion of the Ebro in Spain, foreseen in the National Hydrological Plan (NHP) of 2001. It triggered massive local protests, opening also a broad debate among social movements and the scientific community. The New Water Culture, which advoocates for water demand management and the ecosystem approach, became a dominant discourse at the policy level. The intensity of the movement against the NHP helped strengthen representation and political clout of other movements in the Ebro region, e.g. against thermoelectric power plants, wind energy farms, and for the defence of the natural environment. In July 2010, after 15 years of debates, the UN General Assembly adopted a resolution that recognized explicitly the human right to drinking water and sanitation, a long-lasting demand of water activists. It has been argued that some transnational water corporations welcomed the idea of a rights-based access to water, assuming that they would be the ones in charge of provisioning. Against this vision, a (re)commonalization strategy was proposed instead. 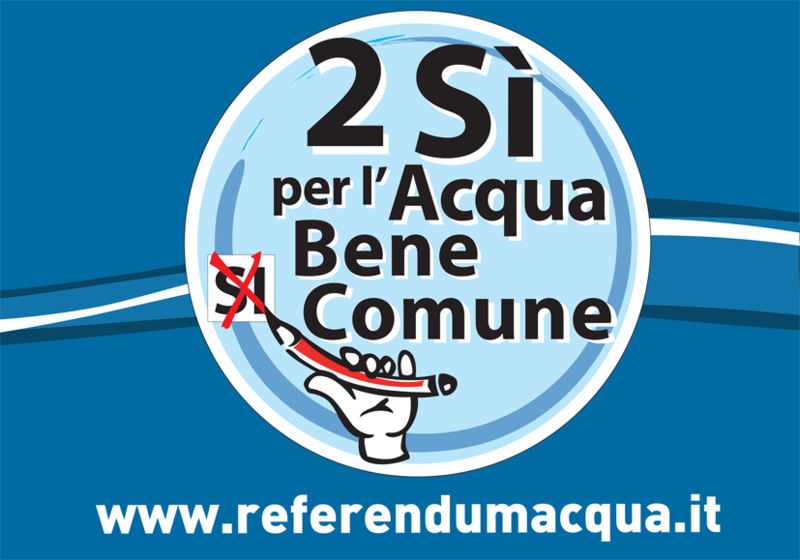 At the European level, the Italian referendum ‘2 Sí per l’Acqua Bene Comune’ (2 yes [votes] for water as a commons) in 2011 was a turning point, promoting a new concept where water is considered as a commons, not to be privatized and subject to monetary valuation. During the nationwide popular referendum on 12 and 13 June 2011 in Italy, 95% of voters repealed a law that would allow the privatisation of water services. Source: acquapubblicatorino.org. Also in the cosmovision of Andean peoples, following the perspective of deep ecology, land, water and air are also subject of rights. The invocation of the Pachamama (Mother Earth) is accompanied by the need to respect her, which translates into an ethical rule for the good of everything, living and non-living. Building on this tradition, the Article 71 of the Ecuadorian Constitution stipulates that nature has the right to be respected in relation to the maintenance and regeneration of its vital cycles, structure, functions an evolutionary processes, a right that can be claimed by persons, communities, people or nationalities. From movements of resistance local or international networks and alternatives are born. More often than not, such struggles are lost by the relatively powerless. However, this article invites to take in earnest the voices, arguments, discourses, and proposals of social and community movements around water, as these can provide interesting water governance alternatives, which are alien to markets or even to state power. * Based on excerpts from Rodríguez-Labajos B, Martínez-Alier J. 2015. Political ecology of water conflicts. WIREs Water, doi: 10.1002/wat2.1092. ** Beatriz Rodríguez-Labajos is a lecturer at the Autonomous University of Barcelona (2005-2009), and a professor at the Autonomous University of Mexico State (1997-2003) and the Autonomous University of Zacatecas (1996). Her research interests are the socioeconomic dimension of risks to biodiversity and ecosystem services. Her field experience includes local development of protected areas in Mexico and social perception of invasive species in Europe, especially in aquatic ecosystems. Currently she is a member of the EJOLT (Environmental Justice Organizations, Liabilities and Trade) coordinating unit.